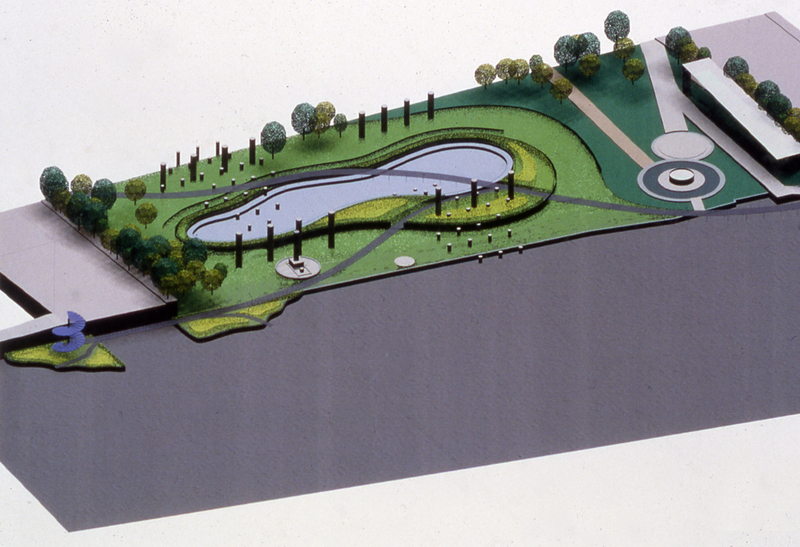 Concept plan by Mary Miss; implemented scheme of reduced scope by Engberg Anderson Design Partnership, 2004. A river is a compelling image. The invisible is made visible as it collects the small streams that run off fields, gutters and streets, the water from homes and workplaces that accumulates in often imperceptible amounts, intervals and locations. A river is physically and visually engaging with its endless flow and continually varying conditions. 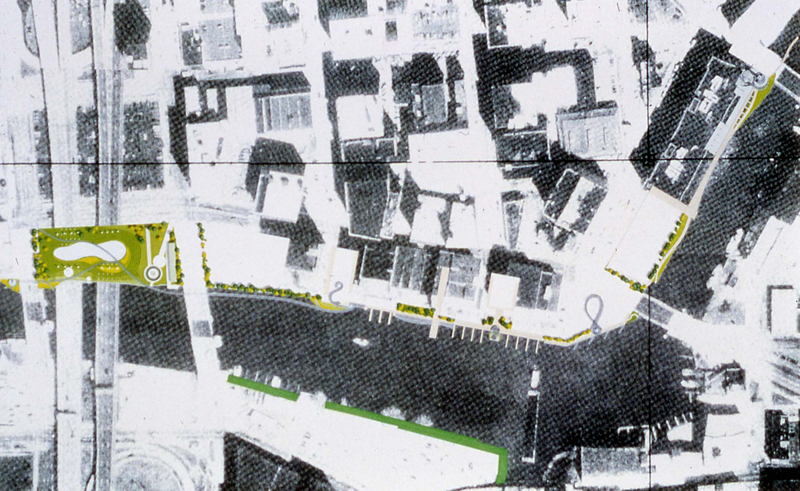 Making these processes and characteristics tangible and visible through a visitor’s movement and sensual contact with the water became the focus of this project on the Milwaukee River in the downtown Historic Third Ward area of the city. This project area, which had been part of one of the largest fresh water estuaries in the world until 160 years ago, was physically inaccessible from the land for decades. Wherever soil had collected or there was a thin border of land, weeds, trees and vines were growing on pile caps or along the fences of parking lots, a reminder that a natural system is in place despite the marginal conditions. 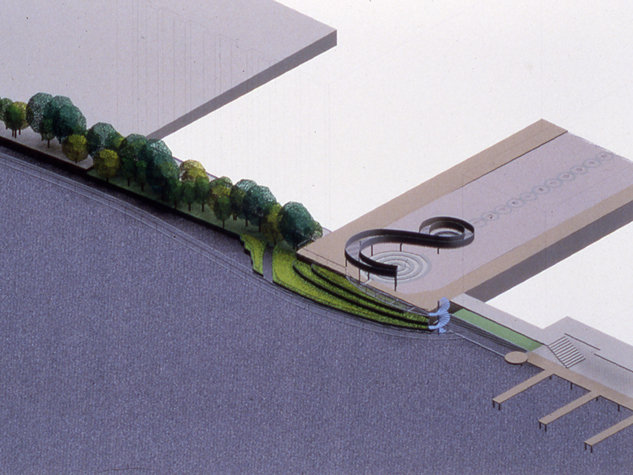 The project uses these survivor elements to recast the site, to change its use and modify its relationship to the city. 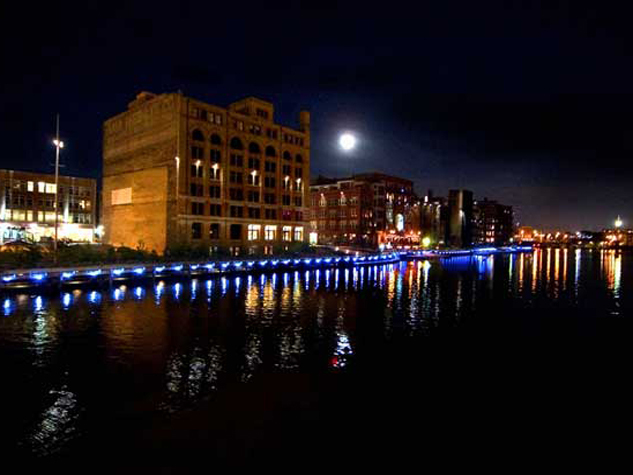 The history as well as the future of the river is the subject of exploration and imagination. The revelation of physical aspects of the river, what its watershed is, where it comes from , how it moves, how it changes, provides different ways to think about the river and our relationship to it. At the same time the project introduces new ways to treat the water that runs into the river and reconfigures its edges, introducing natural systems that encourage the development of habitats below the surface of the water as well as above. 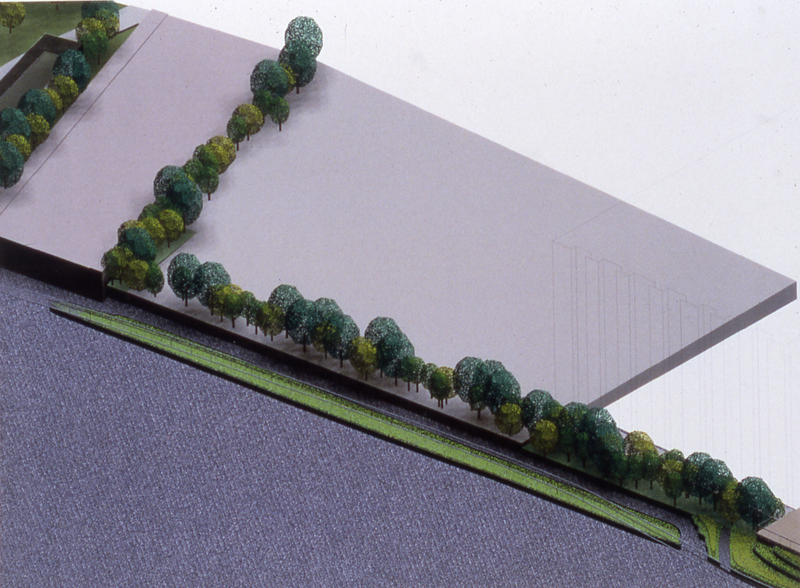 Instead of a collision between the built and natural environments, it attempts to create a seam that configures a positive conjunction between these elements. 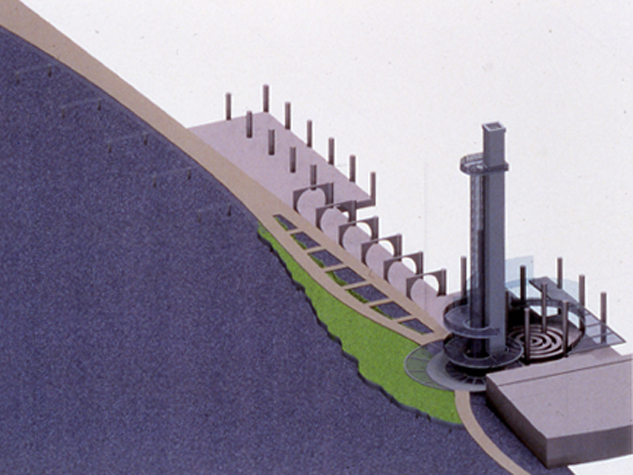 The infrastructure of the city, its highways, bridges, water mains and storm sewers and their relationship to the river will become conceptual and visual focal points of this section of the riverwalk. 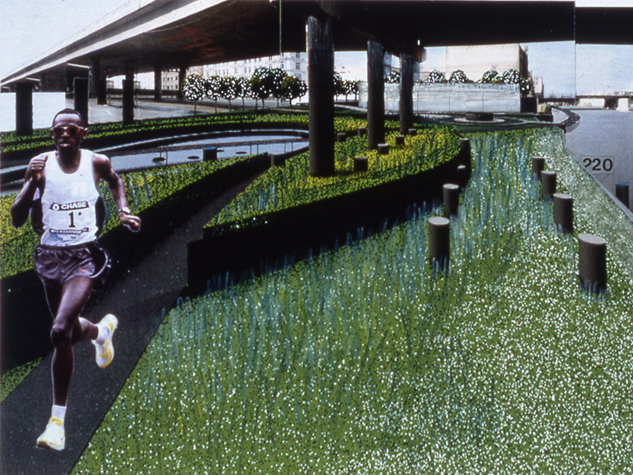 As a person walks the length of the linear route s/he goes through constantly changing conditions and is put into unexpected positions in a sequence of almost choreographed movements. 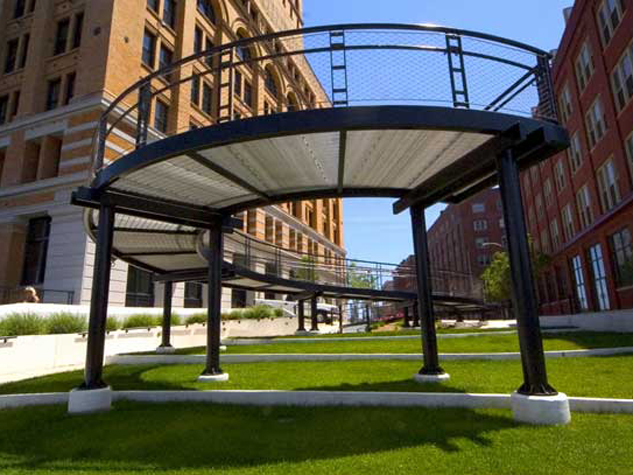 Some – like the ramps and lookouts – are on a large scale, others are smaller transition points or elements like the water-catching trough built into the edge of the walkway. 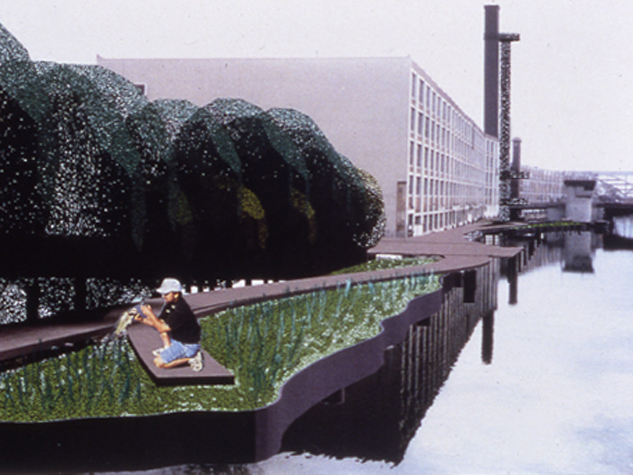 Just as the implications of the project resonate between larger issues of the relationship of urban environments and natural systems to the specifics of cleansing the water from a street, the experience of an individual also slides back and forth across considerable differences of scale. 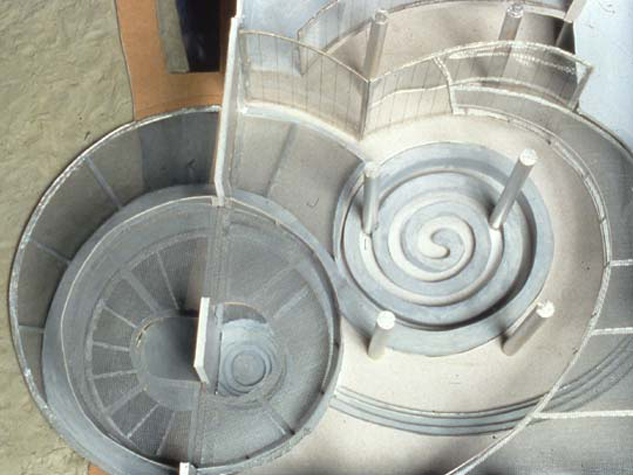 Each section of the route is informed by the previous ones and it is the accumulation of experiences, impressions and information that allows the viewer-walker to develop a sense of the place. The sensuousness of the movement in contact with the river allows a person to become part of the place rather than being isolated from it. 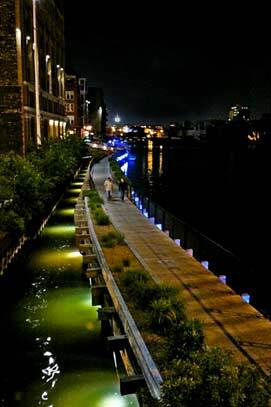 It is finally the individual who follows the seam of the Riverwalk, experiencing it in all of its configurations, who will begin to create a new sense of the river itself and what it will become in the future, in the process knitting it into the context of the city, from which it had been historically divorced.